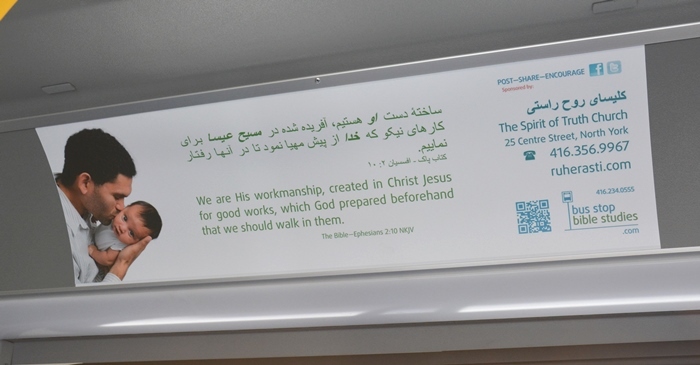 A ‘Bus Stop Bible Study’ is an advertising panel which displays a passage of Scripture, often accompanied with a challenging question or thoughtful comment complemented by an eye-catching graphic or image. Studies are designed to challenge and encourage those who identify themselves as Christians and to show something of the character of God to those who may be seeking Him. ‘Studies’ may be displayed on any public transportation venue in Canada. Venues may include the inside or backs of buses, streetcars, subway cars or any public transit vehicle that has available advertising space. Studies may also be posted in bus shelters, subway stations, airport terminals and ferry terminals, or any entity or forum which receives government financing and sells advertising space.